...where family is first and God is EVERYTHING! 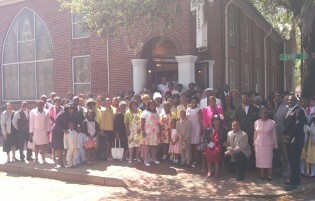 Tremont Temple Missionary Baptist Church is located in the historical district, downtown, Savannah, Georgia, 1110 Martin Luther King, Jr. Boulevard. Tremont had its inception 93 years ago, 1922, with 42 members. Since 1922 the church has evolved several times, with new building structures and additional members. In 1986 God was continually moving in Tremont when the church approved the construction of a pre-school daycare learning center and the enlargement of the Benton fellowship hall. We are a loving family with God as the head. His leadership and guidance has brought us this far. We are praying for his continued guidance as we witness to others about His grace and mercy. We are a guiding star, located on the corner of Martin Luther King, Jr, Boulevard and West Park Avenue, with our beams pointing man to the way of the cross; Just follow the Holy Spirit where our faith is at work and we are using our spiritual gifts to serve God and Humanity. We await your arrival for: Sunday worship,-10am; Sunday School -9am; Holy Communion each 1st Sunday -10am; Prayer service- Tuesday mornings, 6am, Tuesday evenings, 6:30pm and Wednesdays at 12 noon.